Ownership & Retention - Cox Automotive Inc.
Xtime increases customer retention by transforming the ownership experience for service departments and OEMs, increasing customer satisfaction while boosting dealer revenue and profitability. 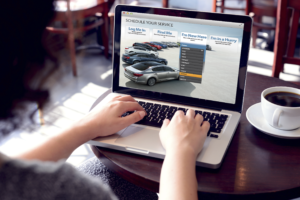 Spectrum, the industry’s first fully integrated, cloud-based system, helps dealerships create an outstanding ownership experience and turn one-time customers into repeat buyers. From the first touchpoint to checkout and beyond, Spectrum creates the high-quality experience customers expect and drives the growth dealerships need. We're here to help! Learn more about ownership and retention or other Cox Automotive brands and solutions.